NASHVILLE, Tenn. – The Tennessee Sports Writers Association announced the 2018 All-State teams for boys and girls golf today, which includes Large and Small classes in Division I and Division II-A and II-AA. NASHVILLE, Tenn. – The Tennessee Sports Writers Association announced the 2018 Girls Volleyball All-State teams on Saturday for Classes A, AA and AAA in Division II and one team for Division II. OH: Staley Humphries, Dobyns-Bennett, Sr.
OH: Shaye Eggleston, Brentwood, So. OH: Jasmine Fuqua, Lebanon, Sr.
OH: Anna Renshaw, Cleveland. Sr.
OH: Lanie Vantrease, Page, Sr.
OH: Julia Wheeler, Siegel, Sr.
MH: Avri Davis, Summit, Sr.
MH: Kelsie Dawson, Ravenwood, So. MH: Hannah Watson, Dobyns-Bennett, Jr.
S: Sophia Bossong, Siegel, Jr.
S: Tori Carpenter, Brentwood, Sr.
S: Kailey Keeble, Heritage, Sr.
S: Brooke Grant, Germantown Houston, So. LIB: Andrea Acevedo, Brentwood, Sr.
LIB: Julia Poarch, Siegel, Sr.
OH: Olivia Cunningham, Knoxville Catholic, Sr.
OH: Marlayna Bullington, Portland, Sr.
OH: Ashlynne Clifft, Jackson South Side, Sr.
OH: Katie Crutchfield, Portland, Jr.
OH: Eden Pafford, Camden, Sr.
OH: Madison Hayes, East Hamilton, Jr.
OH: Katelyn Taylor, Upperman, Sr.
MH: Jannah Brittain, Chester County, Sr.
MH: Maddie Townsend, Sullivan South, Sr.
S: Addie Adams, Upperman, Sr.
S: Hilary English, East Hamilton, Jr.
S: Jordan Vick, Camden, Sr.
LIB: Cassie Kuerschen, Knoxville Catholic, So. LIB: Meredith St. Clair, Sullivan South, Sr.
LIB: Emily Rogers, Portland, Jr.
OH: Natalie Fountain, Watertown, So. OH: Mary Beth Cotton, Loretto, Sr.
OH: Mercedes Collins, South Greene, Jr.
OH: Danielle Jackson, Gatlinburg-Pittman, Sr.
OH: Braelyn Wykle, South Greene, Sr.
OH: Laynee Dew, Halls, Jr.
MH: Anna Elliott, Trinity Christian, Sr.
MH: Sydney Gibson, Sale Creek, Sr.
MH: Madyson Steele, Sale Creek, Sr.
MH: Karly Weathers, Loretto, Fr. S: Brookelyn Davis, Watertown, So. S: Brooke Buttrum, Loretto, Sr.
S: Jayda Perry, Sale Creek, Sr.
LIB: Sydney Murrell, Watertown, Jr.
LIB: Jaden Ezell, Loretto, Jr.
OH: Leoni Kunz, Knoxville Webb, Jr.
OH: Annabelle Sulish, Concord Christian, Fr. OH: Mackenzie Harris, Middle Tennessee Christian, Sr.
OH: Kayleigh Hames, Knoxville, Sr.
OH: Ally Craig, Baylor School, Sr.
OH: Chloe Wilson, Harpeth Hall, Jr.
OH: Denver Rogers, Baylor School, Sr.
MH: Maggie Keenan, Lipscomb Academy, Jr.
MH: Kimari Terrell, Harding Academy, Sr.
MH: Alyiah Wells, Briarcrest Christian, Sr.
S: Loren Robertson, Briarcrest Christian, Jr.
S: Jamison White, Harpeth Hall, Jr.
S: Elaine Redman, Baylor School, So. LIB: Emma Perkins, Briarcrest Christian, Jr.
LIB: Jacquelyn Krumnauer, Father Ryan, Sr.
NASHVILLE, Tenn. – The Tennessee Sports Writers Association announced the 2018 Girls Soccer All-State teams on Friday for Classes A, AA and AAA in Division II and one team for Division II. NASHVILLE, Tenn. – Carson-Newman’s Grant Teichmann earned Tennessee Sports Writers Association Men’s Basketball Player of the Week accolades Wednesday, averaging 20.5 points, 6.5 rebounds and 6.0 assists in two games for the Eagles. The Brentwood, Tenn., native scored 15 points with four 3-pointers and added nine rebounds and eight assists in an 87-79 victory over Anderson University. The senior guard then connected on 10-of-18 shots with four more triples, netting 26 points along with four boards, four assists and two steals versus Queens University. Teichmann is averaging 16.4 points, 5.3 rebounds and 4.7 assists per game this season. NASHVILLE, Tenn. – Trevecca University’s Brittin Boyer posted Tennessee Sports Writers Association Women’s Basketball Player of the Week honors Wednesday, averaging 14.5 points and 13.0 rebounds with a pair of double-doubles in two victories. The Sullivan, Ill., native netted 17 points with a career-high 15 rebounds in a 66-57 victory at Alderson Broaddus, hitting 5-of-7 field goals and 7-for-8 at the foul line. She added three steals and four assists for the Trojans. The 15 rebounds are the most in a single game in the Division II era at TNU and the most caroms in a contest for any Trevecca player since 2011. The senior forward followed that with 12 points and 11 boards in a 65-62 win at Davis & Elkins, connecting on 4-of-6 from the field and 4-for-5 at the foul line. Boyer is averaging 11.1 points and 7.6 rebounds per game this season. NASHVILLE, Tenn. – Belmont’s Dylan Windler earned Tennessee Sports Writers Association Men’s Basketball Player of the Week accolades Monday, averaging 23.0 points and 8.5 rebounds in two games for the Bruins. The Indianapolis, Ind., native netted 23 points with eight rebounds, two assists and two steals against Jacksonville State, connecting on 8-of-11 shots from the field with three 3-pointers. The senior followed that with 23 points and nine boards along with two steals versus Tennessee State, hitting 8-of-14 field goals with a pair of triples. Windler averages 18.8 points, 9.2 rebounds and 1.9 steals per game through 13 contests this season for Belmont. NASHVILLE, Tenn. – Maryville College’s Klaire Varney posted Tennessee Sports Writers Association Women’s Basketball Player of the Week honors Monday, registering 22.0 points, 8.3 rebounds, 5.0 assists and 3.7 steals with a pair of double-doubles in three outings for the Scots. The Crossville, Tenn., native posted 15 points and 12 rebounds versus Emory University but followed that with 26 points, three boards and four assists in a victory at Agnes Scott College. She made 10-of-14 shots overall with three 3-pointers against the Scotties. The sophomore guard then netted 25 points with 10 caroms, five assists and eight steals at Huntingdon College, connecting on 7-of-17 field goals but hitting all 10 free throw attempts. 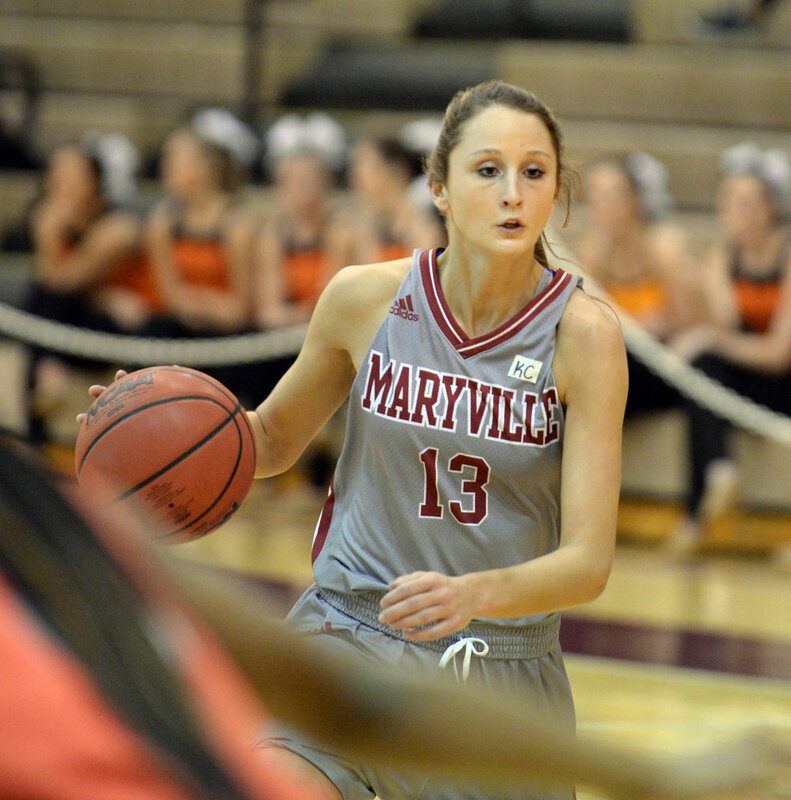 Varney averages 17.9 points, 6.6 rebounds, 3.6 assists and 3.6 steals through 14 games this season for Maryville.